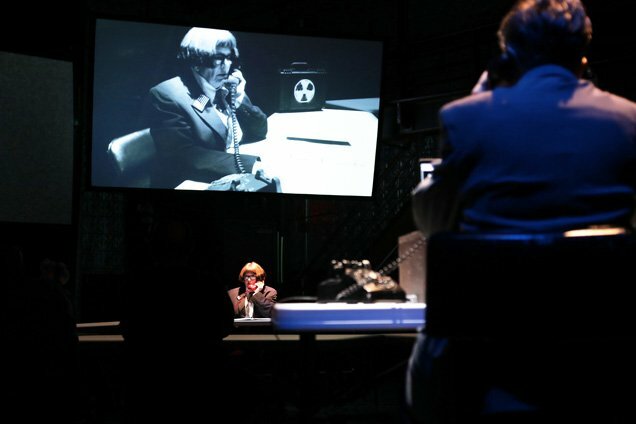 Lois Weaver and Peggy Shaw make up legendary political performance company Split Britches. Their show UXO Unexploded Ordnances is coming up at the Barbican next week from 15 May. 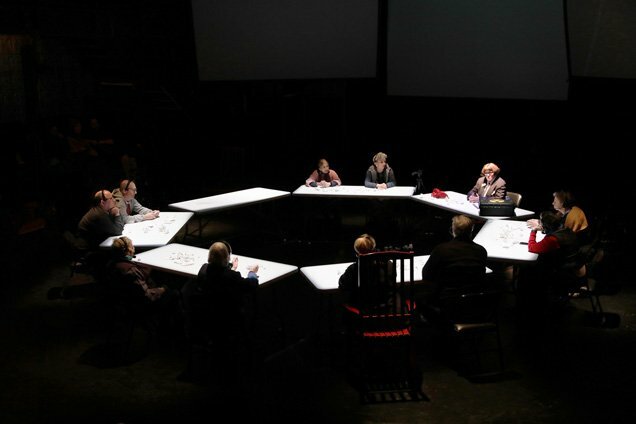 Combining a Dr Strangelove-inspired performance with a daring forum for public conversation, this show explores ageing, anxiety, hidden desires and how to look forward when the future is uncertain. What inspired you to create UXO? L: Two things, really. The first thing was we came across this term “unexploded ordnance,” which is a buried explosive left behind in an area of conflict. We came across this term, and we have been working with elders because we ourselves are elders. We try to work through our own questions about life in performance and we thought it’s a good metaphor for unexplored potential, especially in elders. So we started playing around with that idea, keeping in mind that it had a military kind of influence. Then Peggy got obsessed with the film Dr. Strangelove, and so we thought we’d use Dr Strangelove as a kind of spine, and built some of these other ideas around it. P: I think the other thing is that we hadn’t been in a show together since before my stroke in 2009. So we wanted to make a new show together because we had both been doing solo work. That was our initial reason for doing the show. And the other one came easy once we went to Governors Island and came across the rules that you couldn’t dig in the soil because there might be a Civil War cannonball buried underneath. It was kind of compelling. How would you describe the show to someone coming to see it? Lois Weaver: Over the years we’ve created a way of looking at things in performance. I would say it’s a funny take off on Dr. Strangelove that also seriously looks at all the issues involved. And we parallel that with what it means to get older, to have a short period of time left in your life as an older person compared, to what it might be like to have a short period of time left in your life if there’s a doomsday situation. And so that’s humorous, and it’s also serious, and it’s also inclusive. And it’s visual. And those are all the things Split Britches have always woven together in this multilayered kind of performance. Peggy Shaw: I feel like, when the audience comes in, already they’re a part of the situation and they see the three maps on the wall and they’re moving and they’re bleeping and because of the lights and the way the audience are set up, that they already feel part of the show, that they’re actually in a room where there’s something going on. And it’s all about time, and they know that they show is only going be an hour, or 59 minutes, and they’re constantly thinking about time, and that there’s always time. 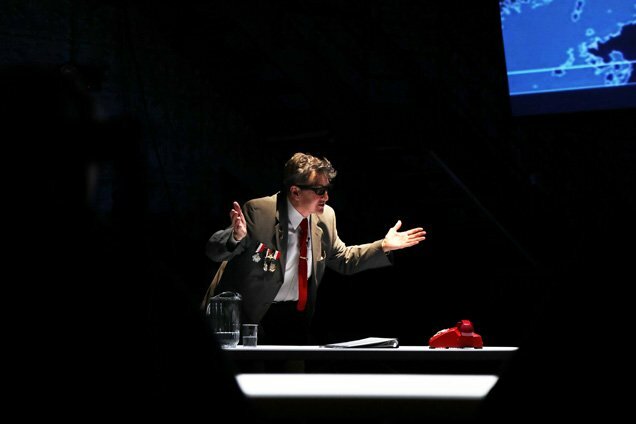 The staging and performance of the show draws on the cult Stanley Kubrick film Dr. Strangelove, how did that come about? Are you film buffs, or Kubrick fans in particular? P: I feel like what we are is kind of obsessive people, and when we’re working on a project, when something enters our brain it becomes part of our process. And Dr. Strangelove for some reason entered my brain and I wouldn’t give it up. It was so beautifully acted and it was so funny, and it was so much like our work in a way, and there were so many ideas in it. The show involves some members of the audience taking part in the show. What would you say to anyone coming to the show but not sure they would like to take part? P: It’s not necessarily for anyone to take part. We make it so easy for people that they actually get disappointed when they’re not going to be the one at the table. We try to get all the elders in the room. It’s not always the most elderly but it usually is because people have a lot to say right now. L: I think that’s right. We’re not asking people to get up there and perform. In fact it doesn’t work when people do that. We’re just asking people to get up and be with us on stage. We just ask people to be themselves and respond to questions. Nobody’s trying to catch anyone out or seeing who’s the cleverest, it’s just about mining, you know, what’s inside an everyday person, which is all of us. P: It comes from trying to find the truth, rather than what we’ve been told is going on in the world. We just did a three-week run at La Mama in New York and every night everything everybody said was different. So, you get to find out what the truth is, how do people feel. Although you’re New York based, you have a long history of performing in the UK – when did you first come to Britain? L: I first came to London in 1977 with Spiderwoman Theatre, and then over the years came back, sometimes the whole company, some part of the company, and just kept performing there. P: The reason we kept performing there is that there were many festivals in Europe, unlike New York. L: We didn’t have any venues in the States at that point that could accommodate a touring company that did any kind of experimental theatre or alternative performance. We experienced a culture of theatre and performance that just didn’t exist in the States. P: And we wanted to bring that culture to New York, because there was nowhere for lesbians and women to perform in New York separately from men. So we decided to create that for ourselves. Any outstanding memories of performing here? L: As Split Britches we performed at OvalHouse and then we performed at the Drill Hall. We took our Dress Suits to Hire there and Drill Hall was the site of real queer performance, lesbian and gay performance, so it was great to be there. I think we spent a lot of good times in the UK. It was the first time that I realized that I could be in a theatrical community where you had access to loads of different kinds of talented people. Whereas I felt like in New York people were very compartmentalized and isolated. It felt like when we went to London we had the opportunity to set up some great collaborations. The other thing we got excited about when we first came to the UK was that people liked to talk about politics. One of the things that had happened in the U.S is that you couldn’t disagree with anybody. If you disagreed with somebody, then you were a communist. I remember when we would sit around a dinner table at women’s houses in London, people were really disagreeing with each other, and it was so refreshing because here, in my experience anyways, people either agreed with you or didn’t, a kind of love you or leave you attitude. Any specific memories about performing in London? L: We had great times performing in London. Coming from New York where the city was open 24 hours a day, it was a bit of a shock to be in a city where everything shut down at 11. And so drinking was a problem, but also getting home was a problem and we didn’t have money in those days so we couldn’t really afford taxis, and so you panicked if it got to be past 11. I remember being at a party and us thinking “oh god how are we going to get home” and these two women were there on motorcycles. They said, “oh we’ll take you home!” and so we each got on the back of their motorcycles and they took us on this wonderful 2am foggy tour, all through all the sites of London.